The missing link on Scotland's busiest motorway is to be completed after ministers gave the go-ahead for an upgrade to the M8. The motorway, which links Glasgow and Edinburgh, becomes an A-road for a six-mile stretch between Baillieston and Newhouse in North Lanarkshire. This will be upgraded to full motorway status following the improvements. It is hoped tenders for the work will be approved in 2011/2012. A completion date will be confirmed at a later date. A public inquiry into the proposed M8 upgrade was held in 2008 and the reporter's conclusions were submitted to ministers in October of that year. 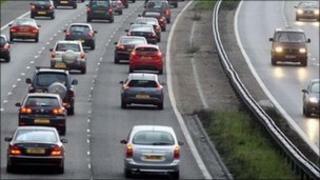 A separate report on other M8/M73/M74 improvements was submitted to ministers in July 2009. Earlier this year, ministers were accused of causing unnecessary delay to the M8 upgrade by failing to act on these reports. Scottish Labour claimed that work should have been completed on the scheme by 2010 but that had now slipped to 2013/2014. Finance Secretary John Swinney gave the go-ahead on Tuesday after considering the findings of the public inquiry. He said: "The M8 is a key section of Scotland's strategic road network, linking Scotland's two biggest cities and connecting businesses and communities. "Having given careful consideration to the issues and arguments, I agree with the reporter's findings and reasoning, and with his recommendation to proceed with the long awaited upgrade to motorway status of the A8 stretch between Baillieston and Newhouse. "Along with the M74 completion scheme and the M80 Stepps to Haggs, which are both programmed to be completed next year, this upgrade will complete the Scottish motorway network." Confirmation of the upgrade was welcomed by CBI Scotland director, Iain McMillan. He said: "The completion of the M8 between Glasgow and Edinburgh has been a long-standing priority for our members. "Improved connectivity is essential for the success of Scotland's economy and the building of this stretch of motorway is a welcome step forward." Meanwhile, Scottish Labour's transport spokesman, Charlie Gordon, accused the SNP of showing a lack of commitment to the project. "Motorists and businesses all want the project to be completed but delays by the SNP government mean it has slipped further and further behind the original schedule," he said. "If the procurement process is not going to start until next year and a financial backer has still to be found it's hard to see how this project will be completed before the Commonwealth Games in 2014, which would be deeply disappointing." Liberal Democrat transport spokeswoman, Alison McInnes, said: "I'm glad this has finally been approved. The previous transport minister was sitting on this decision for far too long. "I hope we will finally see some other stalled projects get moving, such as dualling the A90 between Balmedie and Tipperty." Scottish Conservative transport spokesman, Jackson Carlaw, said everyone would welcome the announcement "however long overdue" it was. He added: "Given that Scottish Labour did precisely nothing when in government themselves, their complaints of further delay are risible. "The fact remains that both the M74 and M8 completion are progressing in spite of Labour and not because of any muttering by them from the sidelines."